There are some things in this world that I can always appreciate: one is a unique piece of art for my apartment and two...is a great pair of shoes. 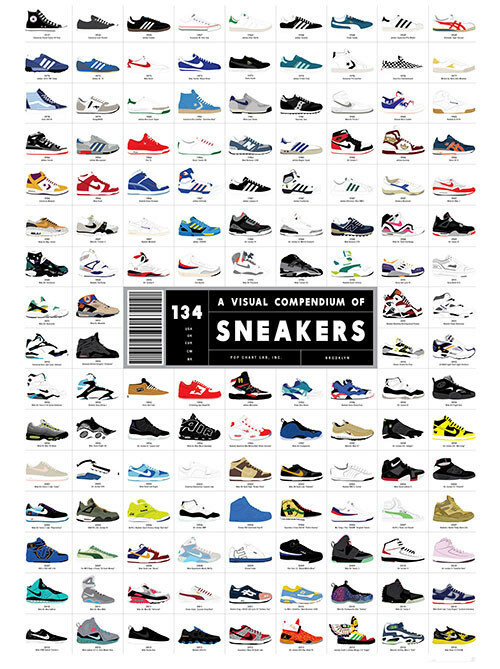 Well today my friends, I present to you both--a poster documenting the evolution of sneakers from Chuck Taylor's to Air Yeezy's and all the iterations in between. I know, I know, this may seem a little bit odd, but to me, a girl who grew up rocking Adidas Sambas (#3) and Umbro soccer shorts every day, this is American creativity at it's finest. Simply put, It's funky, it's colorful, it's broho, and I dig it. PS: Thank you Richie for the recommendation!